JOIN ME FOR A MORNING OF DETOX YOGA AND DEEP MEDITATIONS. ENJOY BEING LED THROUGH A SERIES OF POSTURES DESIGNED TO DETOXIFY AND CLEANSE THE ORGANS, MUSCLES AND BODY, BEFORE EXPERIENCING SOME WONDERFUL MEDITATIONS. BEGINNERS ARE VERY WELCOME, EVEN IF YOU HAVEN’T PRACTICED BEFORE. JOIN ME FOR A WEEKEND OF REJUVENATING YOGA IN A BEAUTIFUL CONVERTED BARN SET IN NORFOLK. ENJOY DAILY YOGA, VEGAN AND VEGETARIAN FOOD AND WONDERFUL YOGA PHILOSOPHY. SEPT 2-9 RETREAT IN TUSCANY, ITALY. WE RETURN FOR THE SECOND YEAR TO THE BEAUTIFUL TUSCAN HILLS FOR A WONDERFUL WEEK OF YOGA, ITALIAN FOOD AND SIGHTSEEING. STAY IN AN ORIGINAL, BEAUTIFULLY RENOVATED ROMAN VILLA AND TAKE DAILY WALKS BREATHING CLEAN, MOUNTAINOUS AIR. TO REGISTER YOUR INTEREST PLEASE EMAIL ME ON SUPERARILIFE.COM. SPACES WILL BE LIMITED ON RELEASE. OCTOBER 28TH, 930-1130AM, HEART HEALTH WORKSHOP, BENTLEY WOOD SCHOOL, STANMORE. If you would like to attend please email rakhee@superarilife.com to reserve your space. WEDNESDAY OCTOBER 15th 6-7pm. The first ever Yoga class to be held at the Queen’s Gallery, Buckingham Palace, in honour of the Splendours of the Subcontinent Exhibition. .
Join me in West Lexham to experience a wonderful weekend of Yoga, Meditation and Restoration. Enjoy home cooked food, practice Yoga in a beautiful converted barn and relax by the fireplace during down time. The theme of this retreat will be detox. In the depths of the winter join me for some re energising and rejuvenating yoga, wonderful home cooked vegetarian and vegan food and great company. An outline itinerary for the retreat is below - please note this is subject to change. 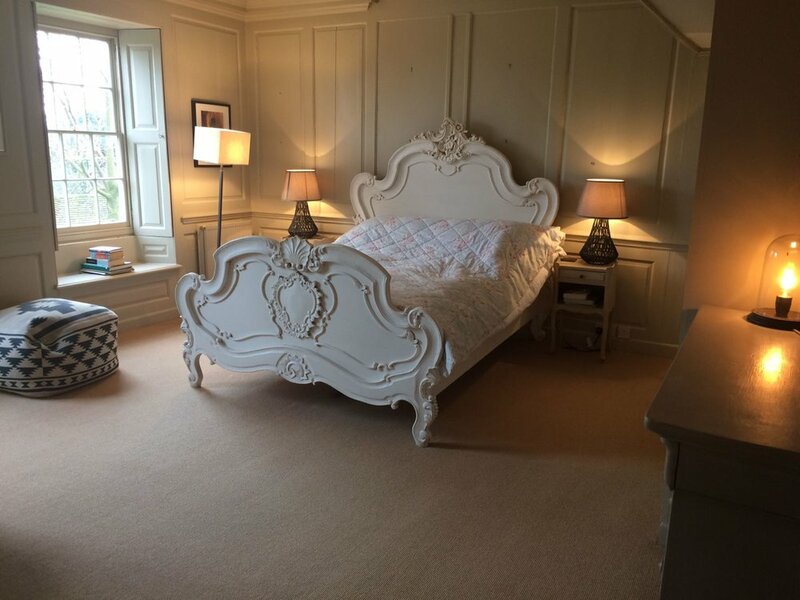 £375 per person (all rooms accommodate 2 people - beds are changeable to double or singles). Offers are available for multiple bookings - please email for details. To make a reservation, guests are invited to make a £100 deposit payment to secure their space. Full payments are then due in November. If you need help in making payments please get in touch and we can make arrangements. Please email rakhee@superarilife.com to make your reservation. The last 3 retreats have been sold out, so be quick! Every single attendee, when asked if they would like to attend another retreat like this again, answered YES. Can't touch your toes? Feel really inflexible? Need a good stretch? Training got you feeling stiff? Whatever the reason, join Yogi Rakhee for a glorious workshop designed to deeply stretch your whole body. This workshop will leave you feeling limber and light - as well as calmer and more relaxed. The first ever Chi Kri Yoga Hip Hop Yoga workshop hits Finchley in September! Get ready for an amazing and fun Yoga experience, as you move through postures and sequences to incredible Hip Hop beats! This session is open to all levels and anyone aged 14 and over. SIGN UP here - http://tinyurl.com/h2te8an - and we look forward to seeing you there! THE RETREAT! It's here! A wonderful weekend of restoration, replenishment and re energisation. Join Yogi Rakhee for a weekend in Kent, filled with Yoga practice, vegetarian food and Yogic philosophy. Only 16 spaces! Email rakhee@chikri.com for more information. 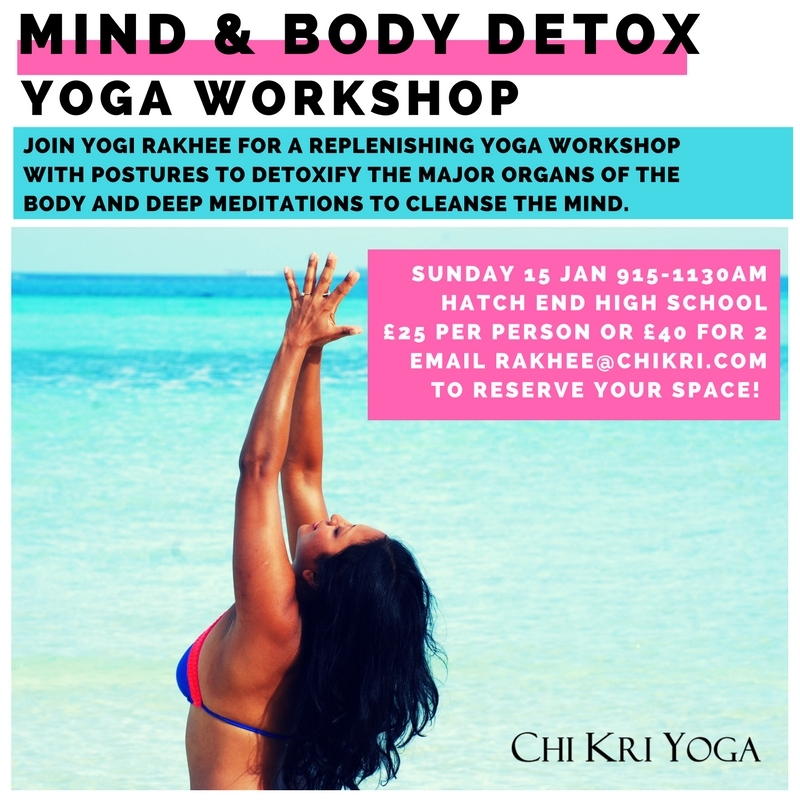 Enter a peaceful world of Yoga and Mindfulness as Yogi Rakhee takes you through calming postures, awareness exercises and breath observations. Perfect for those with stress, anxiety and sleep disruption. Start the new year with a total mind and body detox! Join me as I take you through postures that will detoxify the organs of the body and meditation techniques to help cleanse your mind.